RMS Adriatic was an ocean liner of the White Star Line. She was the fourth of a quartet of ships measuring over 20,000 tons, dubbed The Big Four. The ship was the only one of the four which was never the world's largest ship; however, she was the fastest of the Big Four. The Adriatic was the first ocean liner to have an indoor swimming pool and a Turkish bath. She was built by Harland and Wolff and was launched on 20 September 1906 (the same day as the Cunard Line's Mauretania). When she was completed, she was 75 ft wide (23 m). 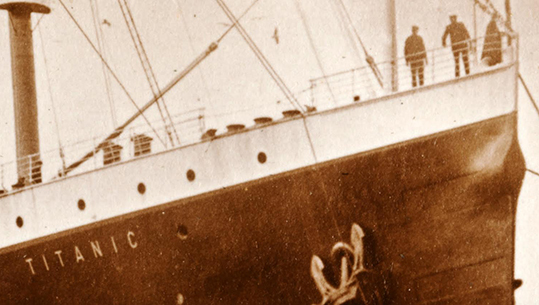 She set off on her maiden voyage from Liverpool to New York on 8 May 1907 under the command of Captain Edward Smith. She was changed to the Southampton run after her maiden voyage. She was, however, the ship that inaugurated White Star's Southampton service and was the first White Star liner to use the newly constructed dock in Southampton, named the White Star Dock (it was renamed in 1922 to the Ocean Dock). She ran this route until 1911 when Olympic took it over with the Adriatic returning to the Liverpool run. During World War I, the Adriatic served as a troopship and survived the war without incident. After the war ended, she returned to passenger service. In 1928, she was converted to a "cabin-class" ship. In 1933, she was withdrawn from the North Atlantic route and was converted into cruising. The Adriatic left Liverpool for the last time on 19 December 1934, her longest voyage ever, to be scrapped at Onomichi, Japan, in 1935. Queenstown, Ireland, April 11th, 1912. There are many photographs of White Star officers proudly posing in their shiny uniforms. But there are relatively few photographs that show them at work or on duty, allowing a glimpse of what life as an officer was really like. 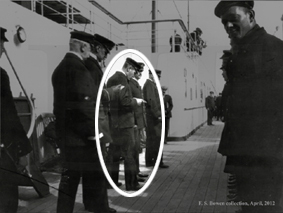 Of course, one of the most famous last images of Titanic's crew on duty is a photograph of Second officer Lightoller and First Officer Murdoch as they prepare to close the gangway before departure from Queenstown, on Thursday April 11th. 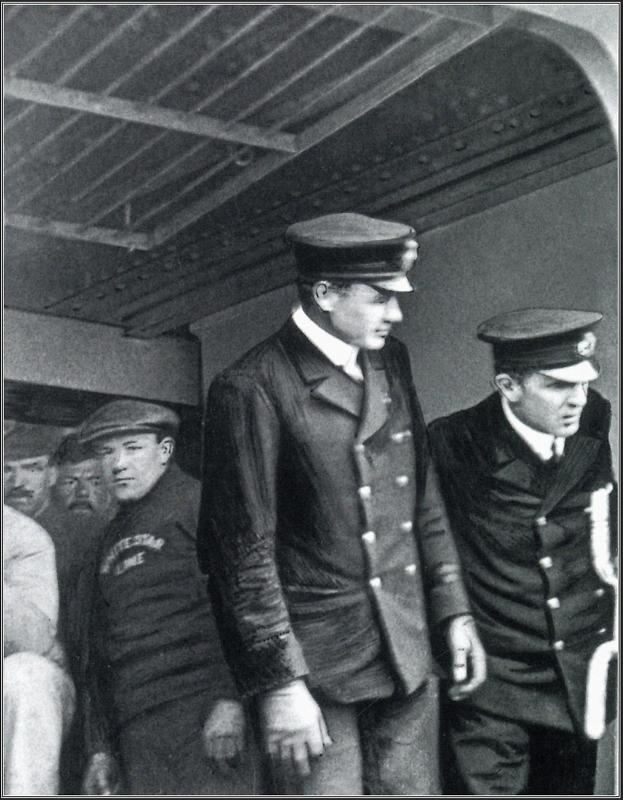 It is the last photograph of Murdoch or any Titanic officer ever seen on duty. It is interesting to note that this photograph reveals that Lightoller is apparently still wearing his first officer's stripes (two stripes), which would also indicate although not clearly seen in the image that Murdoch would be wearing his Chief Officer's stripes (three stripes). It leads to the very real possibility that although their ranks had changed due to the last minute deck department reshuffle, their uniforms had not, which would explain later confusions involving Murdoch still being called the 'chief officer'. 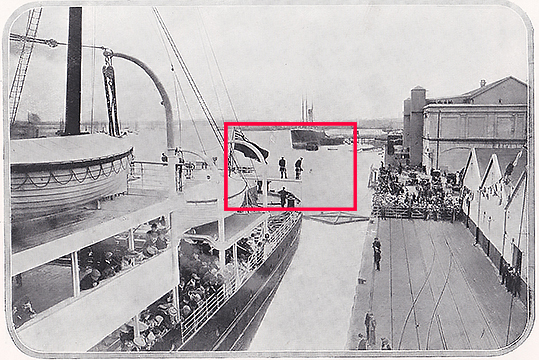 In this close up from the above photograph we can clearly see First Officer William Murdoch working at Titanic's gangway on departure from Queenstown. In 2014 an album went on display containing 116 black and white images taken by Harland & Wolff director and senior engineer John W Kempster when he was at Harland and Wolff at the time of the construction, launch and departure of Titanic. 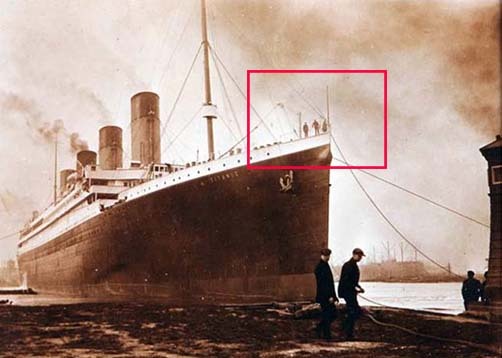 One of the unpublished photographs of Titanic at Belfast is her poised by the East Twin Island light tower, prior to her run into the open sea, 2nd April 1912. 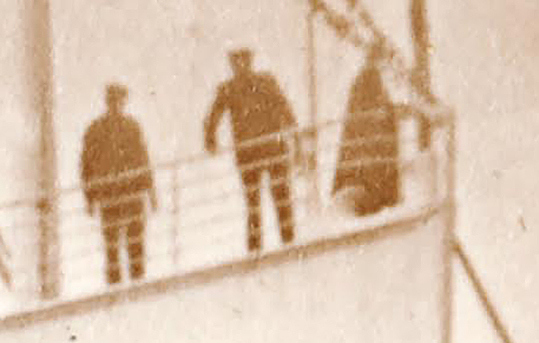 According to Senan Molony, author of "Titanic Unseen: Titanic and Her Contemporaries" that includes the Kempster photographs, this now famous image includes Chief Officer Murdoch (prior to his demotion to First officer on April 10, 1912), standing with his back to the rail on the forecastle of the ship. Molony explains: "It was the Chief Officer's duty in the White Star Line to be on the fo'c'sle when leaving port. Murdoch held this role until Southampton. It's also his build and stance and he's the sole officer there." In May 1907 Murdoch became first officer on the new Adriatic which was at the time the largest White Star Line ship, the fourth of the "Big Four", the Master Captain Edward John Smith. Adriatic's maiden voyage departed from Liverpool, England, for New York. Subsequently White Star's premium service to the United States departed from Southampton, not Liverpool. 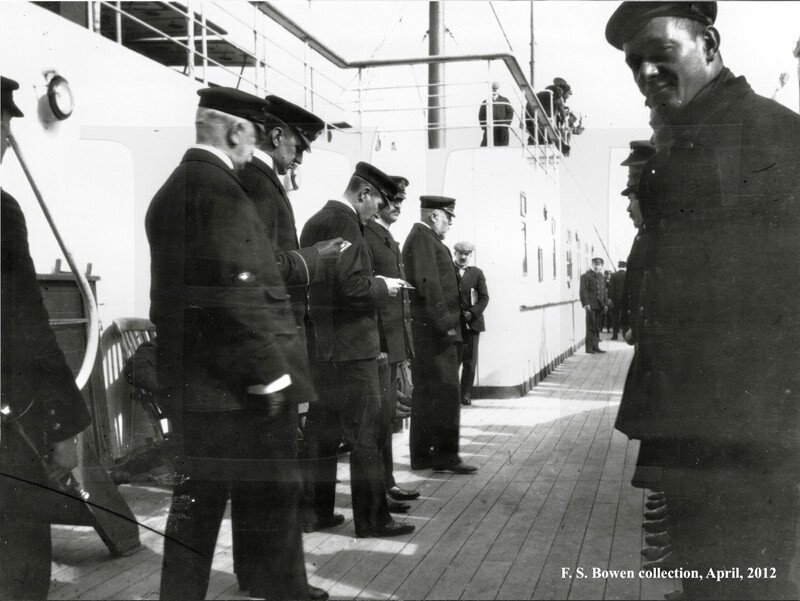 It is on the occasion of this change and first departure, from Southampton, June 5th, 1907, on the new Southampton-New York route that two officers can be seen on the aft bridge. The first officer's duty was indeed to be stationed on the aft bridge, so one of these is most likely William Murdoch. The Adriatic on its first sailing from Southampton, June 5th, 1907, on the new Southampton-New York route. 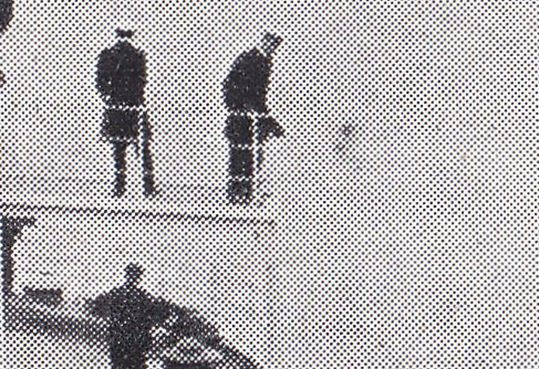 Two officers can be seen on the aft bridge. And in an intriguing photograph we spot the very likely form of First Officer Murdoch on the Adriatic during what appears to be a crew muster or briefing. Murdoch is looking down at a paper or book while Captain Smith speaks to the crew. In a close up from the above photograph of Captain Smith on the Adriatic we can see the officer certainly looks like William Murdoch. 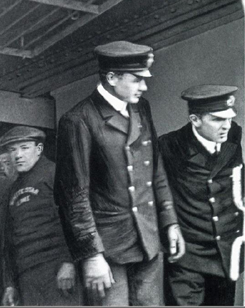 What Did Titanic's Officers Look Like?